The Conch Republic Media Group, is a travel marketing network of broadband video, interactive websites committed to promoting tourism and quality businesses in The Florida Keys and Key West. With informative, entertaining video episodes, The Conch Republic Media Group provides youwith the latest and most exciting travel destinations that The Florida Keys and Key West have to offer, it’s free and on demand 24/7. The Conch Republic Media Group and it’s flagship site ConchTV.com covers the complete Florida Keys and Key West with topics like accommodations, arts, attractions, boating, bridal, dining, diving, bars, entertainment, events, family, fishing, living, news, realtors, shopping, social networking, tourism, weather and watersports. Users can enjoy travel videos, get driving maps, visit business and destination websites plus print value savings coupons and travel brochures. The Conch Republic Media Group and Conch TV.com make Florida Keys and Key West vacation planning easy! Our in house expert travel hosts bring you behind the scenes for first look video access into “The Conch Republic” lifestyle and the diverse people who define it. Don’t forget to log in every day and stay up-to-date on our most recent travel video segments and the Florida Keys and Key West information. From fishing the blue coastal waters, diving the reefs, poling the flats, searching for sunken treasure, or simply relaxing to local songs performed by our talented musicians, The Conch Republic Media Group has the pulse of the Florida Keys brand. The Conch Republic Media Group is headquartered in the center of Old Town, Key West, just around thwe corner from the famous The Margaritaville Cafe.. Our experienced management team, high definition video film crew, and marketing group are all Key West locals. We live and enjoy the Florida Keys lifestyle each and every day. Covering Key Largo to Key West and on to Cuba, The Conch Republic Media Group produces excitng TV shows from the “American Caribbean”, The Florida Keys and Key West. 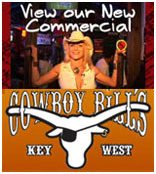 ConchTV.com is the ‘Go To” website for information and videos about the Florida Keys and Key West. From Arts to Watersports you’ll find it on ConchTV.com. It’s internet television from Key West and The Florida Keys for both tourists and locals! In addition to ConchTV, The Conch Republic Media Group also owns and operates the number one Trop Rock internet radio site ConchRadio.com. There,” The magic is in the music” Non-stop Trop Rock music and High Definition videos about the Parrothead lifestyle streaming direct from Key West, Florida. You can listen to Key West Music anytime on Conch Republic Radio It’s both Key West Radio and Florida Keys Radio. The Conch Republic Media Group specializes in High Definition Video Production, Web Site Design, Web Site Hosting and Maintenance, Digital Photography plus Internet, Television, Radio and Print Advertising.